Welcome to our First Unit in Socials 9! ​Welcome to an exciting year of Social Studies 9. It is a year of bloody revolutions, civil wars and profound changes many years ago that still reverberate in society today. Get ready for an action-packed thrill ride of a course where we study English Kings, Cromwell, Napoleon, First Peoples of North America, Explorers and the geography of Canada. ​As a class, I like to start out by building expectations with students about behaviour, attitude and academics. We will sit down and design these as a group. But first, a small video that captures the core of the problem with modern societies fixation with technology. When we are on our phone, we are fundamentally missing living in the moment and experiencing the joy of the moment. Rather than document the moment via text, try to make sure to experience and savour what is right in front of you. 1. Students will sit in alphabetical order - this helps Mr. Fitton memorize student names quickly. 2. We will create "2 truths and a lie" cards where students will write out 2 truths about themselves and a lie. The class will try to determine the lie - it is a neat way to learn about each and every one of you. 3. Course outline. Students will be given a copy of the outline of what will be covered in the course. See the document below. ​-After the course outline, we will co-create classroom expectations as a group. -Students have the opportunity to provide their input. 5. Today we are going to look at the concept of history and "Time" and how modern, written human history is rather short. We will watch the video "The history and Future of Everything." It provides a background for the next activity that we will undertake. An approximately timeline activity outside. 6. First Assignment: Using the Whiteboards! Get into groups of four and brainstorm an event to share with the class. We will put on a timeline. 7. If time, we will play "The Game." Students will each be given a small chunk of a cut up text. It is a game of listening and acting according to events around you as they unfold. We will do it for time and see what the best time we get is. a. 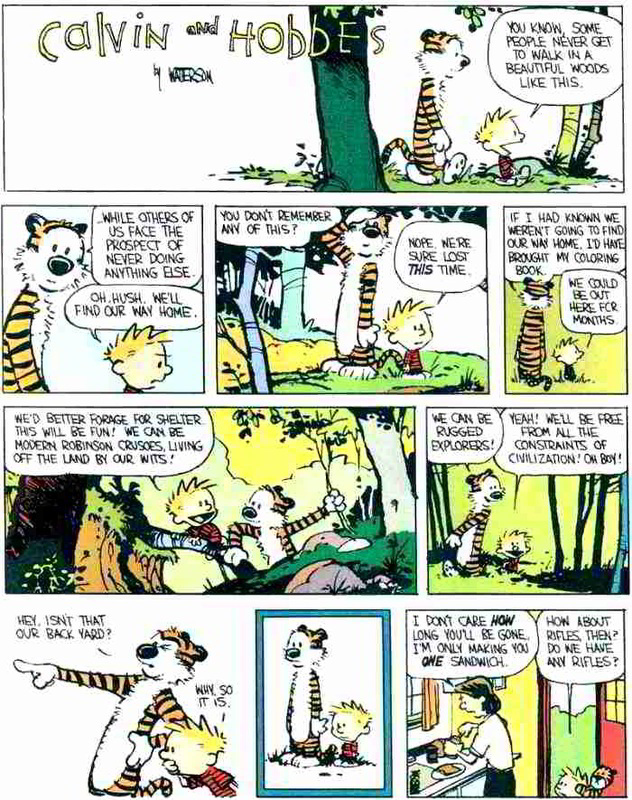 Show Indiana Jones Clip and Calvin and Hobbes Comic. What is our perception of explorers? Explain the word Romanticism. ​​b. Read realities overhead. As a class, we will read about some of the terrible realities of being an explorer. Not as glamorous as Calvin and Indy make it out to be. C. see what students already know about explorers. Any names etc. – what is exploring? Then proceed to read the unit introduction as a class. On page 216. 3. Read Page 216 as a class. 5. Present to the class on our explorers. 1. Present Explorers (if any groups have not). ​2. Watch John Green's the Columbian Exchange. Students will write down on scrap paper, 5 things they learned from the video. We will pause several times to discuss. Vikings Part 4 0-3min. Columbus Part 4 12:50--14 min Cabot Part 4 14min-end and Part 5 0-2:40 Cartier Part 5 4:40-end and part 6 beginning to 7:40. 4. Work on Chapter questions. Below is a copy of the unit chapter questions and key vocabulary to know. -Cartier tried to establish a permanent settlement in Canada but failed. French King not interested just wants resources and nothing else. -instead they became skilled farmers. -Allied with Hurons too in West and discovered that they had many furs. -Champlain (and France) only saw Canada as useful for resources, still don’t want farmers. Establish Coureurs de Bois to get furs and intermarry with aboriginals to strengthen the alliance. 1524, sponsored by the French, looking for Northwest passage (passage through Arctic to Asia, doesn’t exist because of 365 days of ice). 4. Have time to prepare creative review on an explorer. Choose from a children's song or a Christmas Carol, skit, trading card, comic, poem, play dough etc..
​6. Work on Chapter questions when done. 1. Presentation on local indigenous culture and the four food chiefs. We will be going to the library and having a presentation where we eat food and learn crafts created by the plateaux people. Lesson 5 - Finish up unfinished items from the unit and review game! 1. Finish up any incomplete segments on famous explorers. 1. Review Explorers with Historica Minutes. In Chronological order of when they arrived in Canada. ​4. In groups, pick one Creation story from any of the aboriginal groups we took notes on yesterday. 5. ASSIGNMENT: Mr. Fitton will distribute the next assignment. Basically, you will summarize in a small paragraph who your aboriginal group is (Where they live, main cultural traditions), 5 sentences Maximum. Put your paragraph on chart paper. Go over an example of each kind of summary. These techniques are useful when you are trying to review for tests because putting things into your own words helps you remember them. Review the rubric I will be using to grade them. 1. 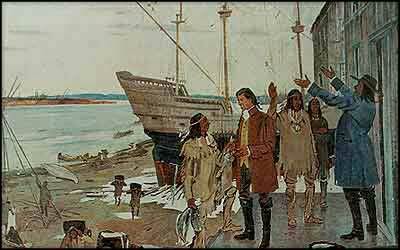 Because of 13 colonies in US, France finally interested in building a permanent settlement, 2 things help them do this, the Jesuit missions and the coureur de Bois. Review Champlain in a powerpoint. 3. Class discussion of the ethics of communicating religion with other people. What is ok? What isn’t? Should missionaries be allowed to go door to door to spread their message? Should missionaries be allowed to set up schools in 3rd world countries for the purpose of converting their students to their religion? 3. Read: 234-235 – Coureurs de bois section. 4. 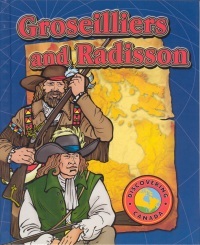 Have students write notes on who Radisson and Grosseliers were and the importance of HBC. 5. Video Clip: Business Suit Trappers: Kids in the hall. Explain how we will be learning about a distinctive type of people; The “Coureurs de Bois” who were the ones who sought furs in Canada. Birch bark canoes etc. These 2 groups brought people to Canada who would actually live there and started building European settlements that would last. Snowshoeing Trip - As a class, we went snowshoeing to have a hands on perspective of what it was like to be an early explorer or one of the First Nations Groups in Canada. We then filled out a reflection sheet. Jean Talon: Position: New France’s first intendant Ideas: Knew New France needed settlers, good defense system and basic industries, recruited women who had the least to gain by staying in France, knew mercantilism was important. Impact: Soldiers made colony safer, established a brewery, lumber mill and tannery that did not complete with French industries, but made trade and life in the colonies easier, allowed small ships to be built. This made New France stronger, more self-sufficient and profitable to France. Habitants: Paid rent, provide days of service to the seigneur, serve in militia, keep land productive, and grind grain into flour in lord’s mill. Married women had little influence however, worked beside husbands, often knew more about business (men trading furs) and took over duties of farm if widowed. Married women worked on farms and had many children. FAMILY PLANNING – from “Today in History” - MR. FITTON WILL SUMMARIZE THE ARTICLE BELOW - STUDENTS MAY CHOOSE TO READ IT ON THEIR OWN TIME IF THEY ARE INTERESTED. By the 1660’s, the little French colony of Quebec was 2 generations old and not very prosperous. The king of France had given the fur-trading concessions to various merchants from time to time. They were given the exclusive right to harvest furs which were a source of great wealth. In exchange, they were supposed to send out supplies and colonists. They always managed to get their furs, but they always had excuses why they couldn’t do the supplying and the colonizing. So, King Louis XIV and his prime minister, Colbert, decided to handle things directly. They took control themselves and sent out a civil administrator named Jean Talon to make it all work. To the south of Quebec, the New England colonies were thriving. People were pouring in from England and lots more were being born there. Immigrants from all over Europe were welcome. Talon sent back word that what he needed most was a plentiful supply of healthy young women who could raise big families. So, shiploads of young women called “the King’s girls” were sent out, off and on, for the next 20 years. Soon the young men of Quebec had no excuse for staying single. Just to make sure they got the message, their parents were hauled into court and fined every six months a man was single after the age of 20, or a daughter after 16. Bachelors were forbidden to go into the bush to hunt or fish, or to carry on with the Aboriginal girls. Talon had made a survey and decided that Indigenous women didn’t raise big enough families. If all this seems a little heavy-handed, it was just part of the very over-governed pattern of life in a French colony. Laws dictated what people could wear, what merchants could charge, that every chimney had to be swept twice a year and the chimney sweep could charge no more than six sous… endless regulation. To make a system like this work, the king had to make it pay. So, as soon as a couple decided to get married, they filled out the forms and were entitled to receive an ox, a cow, two pigs, two chickens, two barrels of salt meat and some money. When the annual shiploads of girls arrived from France, the girls paraded into a room, picked out their husbands, and went into the next room where a priest was waiting to marry them. This system was going for a few years when the king decided to make it work even better. On the fifth of April in 1669, he issued a decree that conferred a pension of 300 pounds a year on any couple with 10 kids. And 12 kids produced 400 pounds. Those were considerable sums and big families became the rule in Quebec for centuries. And in 1944, our federal government extended the idea across the country when it came up with what we still call the baby bonus, a monthly cheque to mothers. 1. Play "Review Hot Potato" to review for upcoming quiz. Goes over material that is testable from the Chapt. Qs and the assignments. 2. Review How New France was Organized. 4. Show a video that is in French, ask students to take notes. Tell them it is for ten marks and must be perfect. Let them know this would make sense to them if the British had not won the 7 years war (the war we will study today and will understand why we speak English). Also, remember that the way they are feeling is the way that the french would have felt - new rulers, speaking a different language. ​​5. Review last class by reviewing the chapter questions and watching the History of New France video. 7. Explain that there was always rivalry between the French and the English, many struggles for power with Iroquois, English Settlers and British. Often European Wars carried over to North America. -The Acadians became British subjects when France gave Acadia to Britain by the Treaty of Utrecht. - Acadia became known as Nova Scotia ("New Scotland"). -The British government demanded that they take an oath of allegiance to the British monarch. However, most refused. -The British government ordered the mass deportation of Acadians. -In what is known as the Great Expulsion, about 10,000 Acadians were expelled from the colony. -The British destroyed around 6000 Acadian houses and dispersed the Acadians from Massachusetts to Georgia. -The Term "Cajun" for those in Louisiana who speak french comes from "Acadian" = "A Ca'jun"
9. Go through Seven Years War PowerPoint and get them to write down the 10 important points. Go outside and renact The Battle. 2. Watch History of New France video if we didn't get to it the last day. Lesson 11 - This is the End, My Friend.